Building cars is hard, as we all know (some more than others). There’s a lot more to the process than just slapping something together, handing it off to a guy in an ugly polo shirt who says things like “What’s it gonna take for me to get you into this today?”, and and calling it a day. Bugatti, which is no stranger to building cars, recently celebrated making its 100th Chiron, Good going, guys! I myself successfully brushed my teeth this morning. Life is all about little victories. 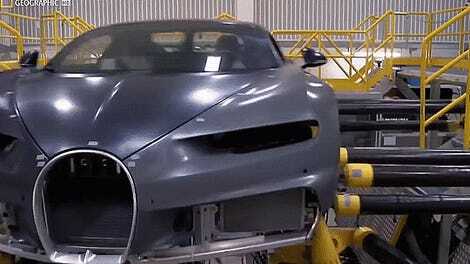 Bugatti has been building Chirons at its headquarters in Molsheim, Alsace, since the end of 2016, the company stated in a press release. And the 100th example just left the factory this week. That means it has taken them 18 months to build 100 cars. What, is handcrafting boutique, 1,500-horsepower cars hard? Please. Bugatti says that “production of the Chiron is running at full speed” and that about 70 cars are built each year. Maybe it’s time the pick up the pace a little bit, hm? We’ve given Tesla heat for its production issues, but here’s a company that is actually making only a handfuls of cars a month. It won’t build more than 500 Chirons total. Which means that building all 500 will take at least seven and a half years if this progress keeps up. There probably won’t even be a world left by then. Maybe they should go for the quantity over quality business model. Mass produce those Bugattis. Charge $1 for them and sell 10 billion. Profit!